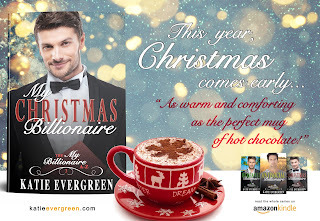 Christmas really is my favorite time of year, and this year the holidays arrive sooner than usual because My Christmas Billionaire is out now! I released it a little early to celebrate the fact that there is only a month to go until the big day. Do you folks enjoy Christmas? I’m so excited to share this tale of festive cheer with you! Is there anything more romantic than a New York Christmas? I wouldn’t know, because I’ve only ever visited the Big Apple during Thanksgiving! But while I was standing on top of the Empire State Building in November it began to snow, and it made me think that this would be a wonderful city to tell a Christmas love story in. I love Merry and Christian so much, and I really hope you enjoy their festive adventure in New York! So wrap up warm, pour yourself a mug of hot chocolate, and dive in!